GIRLS SOCCER The Lady Brahmas benefit from tough preseason matches. Sophomore Emily Le made a goal in the girl’s blowout game against Don Lugo, 6-1, the highest they’ve scored since 2015. 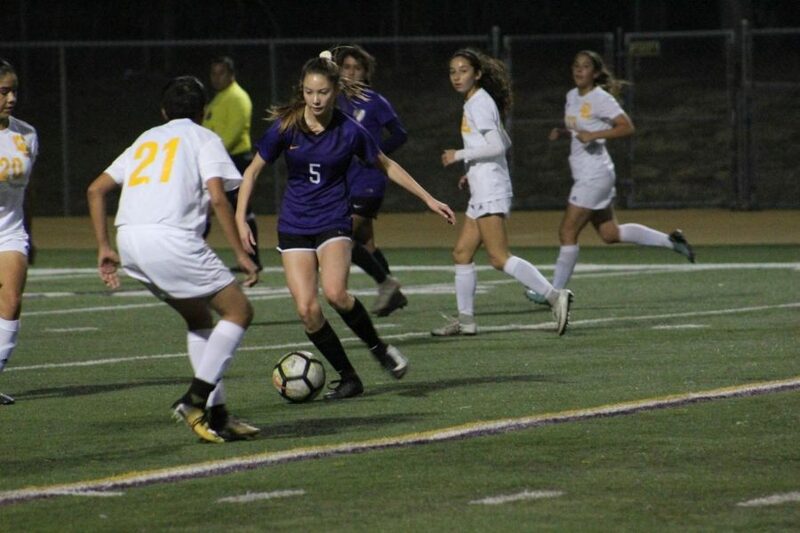 Diamond Bar High School girls soccer head coach Matt Franco attributes the team’s league success to the preseason matches against Division I and II teams. The Brahmas lead the league with a record of 6-0. “We are playing a little weaker competition this league so it’s just making sure they are staying consistent and doing what we worked on against the tougher teams,” Franco said. In the team’s first Mt. Baldy match against Ontario, the Lady Brahmas defeated the Jaguars 2-1. The two goals were scored by sophomore Emily Le and freshmen Isabella Montelongo-Lisak, with an assist by junior Marissa Vasquez. In their second league match against Chaffey, the Brahmas dominated the Tigers, 4-0. Vasquez scored two goals and both Montelongo-Lisak and sophomore Julia Ruelas scored a goal. The team cruised to a win in their third league match against Don Lugo, 6-1. Junior Madison Bernardino scored two goals while senior Olivia Valdivia, Vasquez, Ruela, Le and Montelongo-Liska scored single goals. In their fourth match against the Chino Cowboys, the Brahmas won, 4-2. Valdivia scored two goals while freshmens Alina Valdez and Shantelle Luna scored single goals. They continued this winning streak in their fifth match against Montclair, 2-1. Junior Kaitlyn Morales and Vasquez both scored a goal. The team had another dominating win in their sixth match against the Cowboys, 5-0. Vasquez scored two goals while Valdivia, Beaulieu and Le all scored single shots to bring in the win. The team will be having another league match today in a home game against Ontario. According to Franco, Midfielder Vasquez has been one of the key players on the field. According to senior Jordyn Beaulieu, because the Brahmas have trouble scoring, they have focused their practices around finishing their shots at the goal as well as improving their defensive line. “If we finish this season anywhere other than first place, it’s not because anyone was better than us, it’s because we didn’t want it enough,” Beaulieu said via Instagram.